The term otitis media means that there is inflammation of the middle ear. 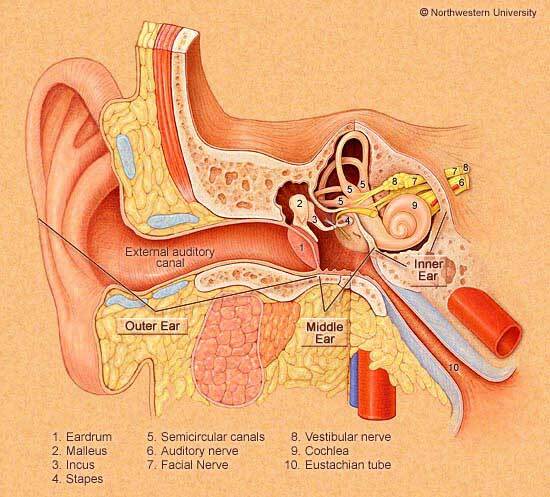 On the diagram to the left, this is the space between the external auditory canal and the inner ear (which contains the snail like cochlea). Otitis media can be associated with an infection or be sterile. In the first case, otitis media is usually caused by bacteria that migrate into the middle ear via the Eustachian tube. Occasionally otitis media may be caused by fungi (Aspergillus or Candida) or other pathogens, such as the herpes virus. In this situation, usually either there is a problem with immune function or (there is a hole (perforation) in the ear drum. Persons with diabetes are particularly susceptible to unusual pathogens such as pseudomonas. In underdeveloped parts of the world, tuberculosis should be considered (Mongkolrattanothai et al. 2003). Sterile otitis media is usually called serous otitis media, or "SOM". The serous variety of otitis media is usually not painful. There is usually a clear or straw colored fluid behind the ear drum. The serous variety is often attributed to allergy but may also occur from numerous other potential sources including radiation treatment (Young and Lu, 2001; Young et al, 2004) or virus (Sade et al, 2003). Serous otitis media may be associated with both hearing loss and vertigo. Swimmers ear (bacterial otitis externa). The condition of otitis externa, often called "Swimmers ear", differs from otitis media, although both may be present simultaneously. In otitis externa, the external ear canal is inflamed. In otitis externa, there may be severe pain and a modest reduction in hearing, but generally there is no dizziness because otitis externa is separated from the inner ear by the ear drum and air filled middle ear. In children a common cause of otitis externa is insertion of something into the ear canal (like a navy bean, for example). In adults, the most common cause is also insertion of something into the ear canal perforating the ear drum (usually a "q" tip, but sometimes hairpins and as well as other thin and pointed objects). Adults may also compulsively clean their ears with cotton tipped applicators, and push wax deep into their external ear canals, resulting eventually in an external otitis. Chronic external otitis is diffuse low-grade infection that can persist for months to years. The disease is characterized by itching, a slight discharge, and a progressive narrowing of the external ear canal. Anything that adversely affects the skin can potentially cause otitis externa. This includes eczema, various rashes, etc. How common is Otitis Media and Otitis Externa ? There are about 30-35 million cases per year of otitis media. It accounts for 3% of all patient visits and is the #1 reason for an antibiotic prescription. Otitis media is very common in children. It is unusual in adults. The incidence of acute otitis media (AOM) peaks between 6 asnd 12 months of age, with another lower peak occuring betwen 4 adn 5 years of age. At least one episode of AOM will be experienced by 62% of children by age 1. Otitis externa in adults is often associated with swimming, and it is called "swimmers ear". Otitis externa is less common in children, although there is a substantial number of children who have irritation of their ears due to insertion of foreign bodies. How is the diagnosis of Otitis Media made? Otitis media is usually diagnosed by the combination of symptoms (ear pain and reduced hearing), and direct observation of an inflamed ear drum with fluid behind it. There is usually fever too. Acutely, in uncomplicated cases, while a thorough examination is necessary, no additional testing is usually required. Certain types of ENT specialists, "otologists", are especially good at making these diagnoses and seeing one of these doctors early on may make it possible to avoid unnecessary testing. Otitis externa is easily diagnosed by looking into the external ear with an otoscope. The main problem with diagnosis is deciding whether or not there is also an otitis media, as often one cannot see the ear drum very well as the external ear canal is swollen, painful and filled with debris. Sometimes the ear canal is blocked by a bump in the bone under the skin of the ear canal (exotosis). This is easily determined not to be otitis external as an exostosis is not painful and not inflamed. Similar bony lumps in the ear canal are sometimes encountered after radiation treatments, usually for an aggressive form of head/neck cancer. How is Otitis Media treated medically ? Typically, otitis media is treated with oral antibiotics (see table above). A bacteria named Strep Pneumoniae is associated with about 30-45% of cases. Other bacteria that cause otitis media include Haemophilus influenzae (about 40%), Moraxella catarrhalis, and Strep pyogenes. There are no strict criteria for use of antibiotics and it is presently thought that overly facile use of antibiotics is responsible for the present rather high incidence of resistant bacteria. The current recommendation is to use a double dose of amoxicillin from 40 mg/kg to 80 mg/kg. (Piglansky et al. 2003). the double dose is currently recommended because of resistance to this drug that began to develop in the 1970's. By 1995, nationasl studies fund that the overall rates of beta-lactamase production (a marker of antibioitic resistance) was 36% in H-influenzae isolates and 95% among M. catarrhalis isolates. Overall resistance in S. Pneumoniae is about 16.7%. Other antibiotics such as cephalosporins, macrolides, and trimethocin-sulfa are used if the initial treatment fails. The main problem with these antibiotics is the development of resistance to them and gastrointestinal side effects (such as diarrhea). The increase in resistance to penicillins such as amoxicillin has been accompanied by resistance to other classes of medications. How is Otitis Media treated surgically ? All of these options involve putting a hole in the eardrum and letting the infection drain out. These procedures are all called "myringotomy". Tympanostomy tubes or "T tubes" may improve hearing rapidly and provide for drainage. It is estimated that between 500,000 and 2 million tubes are placed on an annual basis in the United States. These tubes usually come out by themselves in about 6 months. Usually this treatment is for the serous variant. Drainage from the tube is common with estimates of between 10 and 74%. Laser assisted myringotomy is a method of opening the ear drum with a laser rather than a tube. The eardrum usually stays open for 2-4 weeks. It is possible that the hole may not close. Both infectious and serious otitis media can be treated this way. 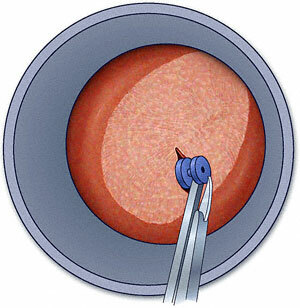 Tympanocentesis -- the ear drum is punctured using a scalpel under anesthesia. The hole in the ear drum usually closes up within 24-48 hours. How is Otitis Externa treated ? Otitis externa is usually treated differently than otitis media. Drops are used that deliver antibiotic directly to the infected skin of the external ear. When the status of the ear drum is unclear (perhaps because it is hard to see) we favor using a non-ototoxic antibiotic otic drop based on a floxin such as ciprofloxin or floxin. Tobramycin based ophthalmic drops have been used for this purpose also. There are many other ear drops that can be used if one is sure that the eardrum is intact (preferably with direct visualization). Cortisporin otic suspension is inexpensive and generally effective for this situation. Sometimes a "wick" is placed to deliver the antibiotics deeper into the ear canal. Local pain medications may also be used. Refractory OE may be caused by resistant bacteria or fungus. Antifungals or Burows solution (a mixture of acetic acid, aluminum sulfate and calcium carbonate) are generally used in this instance. Burow's solution is sometimes injected directly into the middle ear (Kashiwamura et al, 2004) Persons who are immunosuppressed or have diabetes are generally treated more aggressively with a combination of antibiotic drops and systemic antibiotics because of the prevalence of unusual organisms. Fungal infections are more common in this population also and treatment may also require use of an antifungal drug. For chronic otitis externa, medical treatment generally includes steroids, antibiotics and cleaning. Eventually surgery to widen the ear canal may be required. We advise against putting in drops containing alcohol or an ototoxic antibiotic if one is unsure as to the status of the tympanic membrane (ear drum). If the TM is broken, the drops may get into the middle ear and cause hearing loss, dizziness or or severe pain. While otitis media usually resolves uneventfully there are a number of quite serious potential complications. Otitis media may spread to the mastoid sinus (which lies behind the ear), causing a much more serious infection. This is particularly dangerous in persons with impaired immune systems. Otitis media may also occasionally cause a meningitis. Severe or chronic otitis media may permanently affect hearing (Papp et al, 2003) and be associated with dizziness. The hearing loss is typically more severe at high frequencies. The ear drum may perforate (break). In children, otitis media can reduce hearing at a time that is critical for speech and language development. It is very possible for a child to have chronically reduced hearing, without much pain. How might Otitis Media affect my life ? A child may be unable to go to school for several days. Hearing is typically reduced and there is ear pain. Adults generally are impacted similarly. Eustachian tube function may be poor for several months after a bout of otitis media (Caye-Thomasen and Tos 2004). Caye-Thomasen, P. and M. Tos (2004). "Eustachian tube gland changes in acute otitis media." Otol Neurotol25(1): 14-8. Chaffee JR, St Anna L and Grover F, Jr. (2003). "Are nasal steroid sprays effective for otitis media with effusion?" J Fam Pract 52(8): 647-9. Kashiwamura, M., E. Chida, M. Matsumura, et al. (2004). "The efficacy of Burow's solution as an ear preparation for the treatment of chronic ear infections." Otol Neurotol25(1): 9-13. Mongkolrattanothai K, Oram R, Redleaf M, Bova J and Englund JA (2003). "Tuberculous otitis media with mastoiditis and central nervous system involvement." Pediatr Infect Dis J 22(5): 453-6. Pichichero ME. Dialogues in acute otitis media. Volum 1, #1, 2001. Abbott Labs. Piglansky L, Leibovitz E, Raiz S, Greenberg D, Press J, Leiberman A and Dagan R (2003). "Bacteriologic and clinical efficacy of high dose amoxicillin for therapy of acute otitis media in children." Pediatr Infect Dis J 22(5): 405-13. Roland PS, Anon JB, Moe RD, Conroy PJ, Wall GM, Dupre SJ, Krueger KA, Potts S, Hogg G and Stroman DW (2003). "Topical ciprofloxacin/dexamethasone is superior to ciprofloxacin alone in pediatric patients with acute otitis media and otorrhea through tympanostomy tubes." Laryngoscope 113(12): 2116-22.